For shamanic practice there always seems to be an integral use of sound in some form. Is this really necessary? Why? Some will use a drum and other percussion instruments, others a bell, wind or brass instruments, or vocalisation – such as singing, whistling or chanting. There are many forms of each. Some are fairly limited to a specific culture, others are very eclectic. I’ve already explored some implements on this website, and would add a staff as a potential source of sound, to strike and/or with bells attached. This may also apply to the clothing of the shaman – many wear an array of clattering, clanking and tinkling attachments. Of course, sound may be linked with dance, from the uncontrolled ecstatic to the highly ritualised. I guess this depends on the beings intended to ‘hear’ it (or should that be ‘receive it’) – for example, humans and spirits. I can see how humans present can become enthralled by the power of a performance, even frightened and awestruck. I can also see how a shaman may need the drum, dance and song (for example) to attain the right state of mind, enter trance, in order to work with the spirits. Whether the spirits need noise to ensure they pay attention to a shaman is not so easy to prove. I doubt it, so what is the purpose? Well, my explanation is that we use sound as a way to establish a primordial harmonious connection with the state of the spirits, to attune our minds to theirs, to share their reality. This is certainly linked with vibrational energies; not quite a perfect match for audible sound. Dances may be directly associated with spirits, totem animals etc. and so may instruments, calling them to share the ritual. This may extend to the materials used to make the instruments, perhaps a cultural perception that ‘sky iron’ is powerful, or by directly using the bones of people and animals whose power we wish to support our actions. 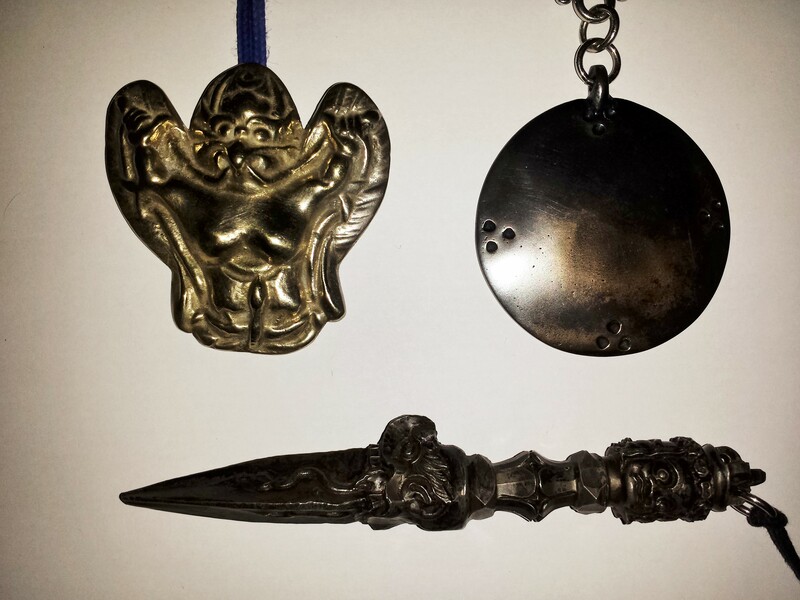 For me, I may use a damaru and bell (as in Vajrayana Buddhism) but more commonly I will chant a ritual or mantras, using gestures (mudras) in sharing the reality of the deities and spirits. According to how I feel, I may deliberately use no audible or recognisable sounds at all – ‘muttering’, whispering or even reciting silently. In that sense, no ‘sound’ is necessary as those beings with whom I am communicating will receive my silent recitation or incantation. 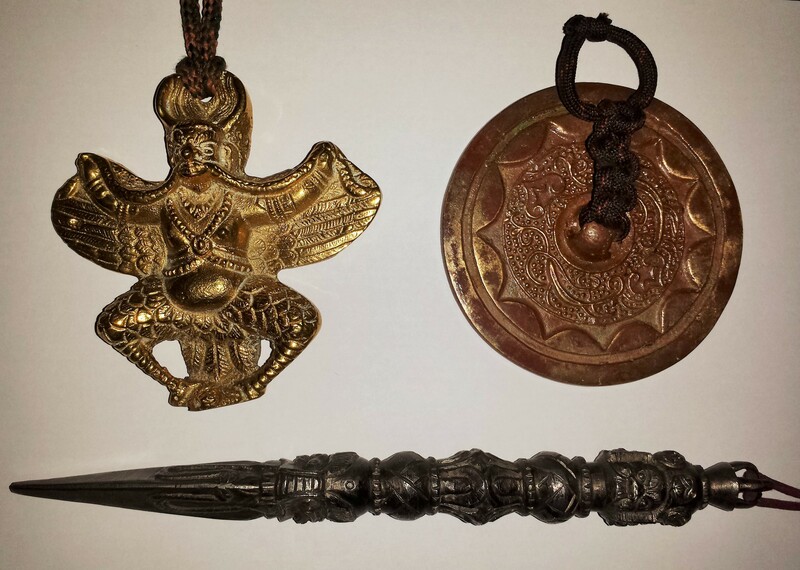 There are explanations of these implements on this website, and my other (khyung.com – dedicated to Garuda). I have a small set, in the form of pendants, which are always with me. To conclude, then, for me it is always necessary to use sound in a form deities and spirits can receive, but not always in a form humans can hear. Note that I use the word ‘hear’, as I have total belief that humans, like other beings, can share sound and vibration which is not reliant on what we would normally call ‘audible’. In terms of Vajrayana Buddhism, the sound of mantra is at the core, yet often only whispered or recited silently. Finally, in terms of sound and ritual, I have my mobile phone, with many songs, mantras, rituals as both sound files, images and text files. I have a terrible memory and for any long ritual it is best to have my ‘portable memory’ with me! I also have them all stored in the ‘cloud’ so can lay my hands on them wherever I am, as long as there is internet access ! What is the history behind the bronze mirror motif? The rim pattern of the mirror in the first picture set is identical to many of the bronze mirrors found in the Kofun tumuli of Japan. The central patterns are similar as well, with only slight variations. Is this a modern replica using varied sources or is there an heirloom direct connection to ancient shamanic mirrors used on location (where?) How many types of patterns are there in use, and do you know the symbolism behind the patterns? I’m afraid I’m not an expert in antique mirrors, so I can’t help you with those details. The first is apparently quite ancient and has obvious traces of cinnabar, but the exact date of it I don’t know. It was bought by me from Nepal but has no provenance. The second one, with the 5 dot pattern, also came to me from the Himalayas, brought back by a couple who acquired some artefacts to sell to cover the cost of their journey.